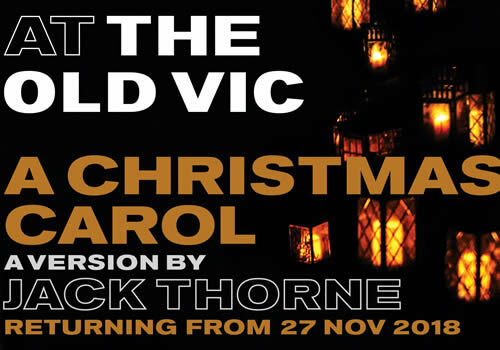 After a sold-out season in 2017 starring Rhys Ifans, Olivier Award-winning playwright Jack Thorne’s celebrated adaptation of Charles Dickens’ classic A Christmas Carol returns to the Old Vic Theatre. Playing a strictly limited festive season at London theatre, the big-hearted, immersive version received acclaim from audiences and critics alike. A Christmas Carol is one Dickens’ best-known tales, following the miserly Ebenezer Scrooge who rebukes Christmas, joy and any form of happiness. Taking place on a cold Christmas Eve, Scrooge is visited by four mysterious ghosts, who transport him to his own past, present and future. Through his own eyes, Scrooge sees what a lifetime of selfishness has turned him into. Can he save himself before it’s too late? Previous casting for the 2017 production included Rhys Ifans as Scrooge, as well as John Dagleish, Maria Omakinwa, Melissa Allan, Jamie Cameron, Erin Doherty, Tim van Eyken, Alex Gaumond, Siena Kelly, Eugene McCoy, Myra McFadyen, Alastair Parker, Golda Rosheuvel and Oliver Evans. Jack Thorne adapts the story for the stage, with credits including Junkyard and the multi-award winning Harry Potter and the Cursed Child. Artistic Director of The Old Vic Matthew Warchus directs, with design by Rob Howell, lighting design by Hugh Vanstone and sound design by Simon Baker. A Christmas Carol also features original compositions and arrangements by Chris Nightingale. An iconic seasonal tale of family, festivities and the importance of sharing, A Christmas Carol has is bursting with mirth and merriment, featuring mince pies, music and plenty of laughter. The production plays a limited season at London’s Old Vic Theatre from November 27th 2018 to January 19th 2019. A Christmas Carol is recommended for those aged 8 and up. Babes in arms are not permitted into the auditorium and all children must be old enough to sit unaided in their own seats. Please note that, as this play contains haunting supernatural themes, younger audiences may find moments upsetting.